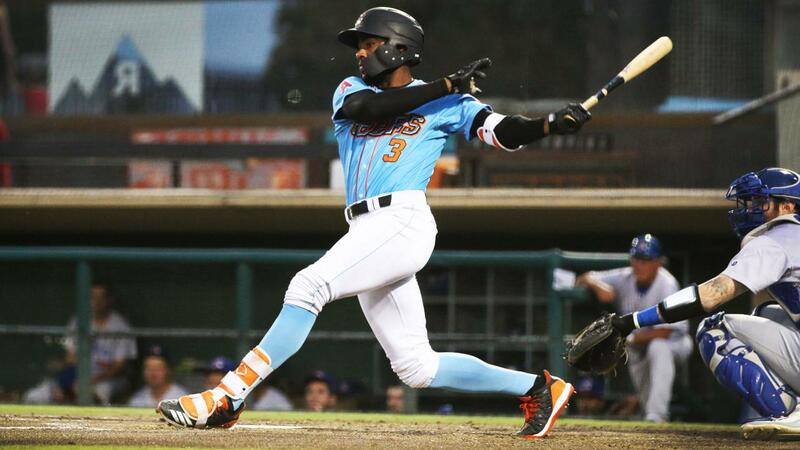 Stockton, CA- The Inland Empire 66ers of San Bernardino used a big fifth inning to overcome an early deficit and got five shutout innings of relief from Isaac Mattson (1-0) to down Stockton 6-2 and take a three-game set two-to-one. The victory capped a six-game road trip to the North Division that saw Inland Empire (50-52, 17-15) go 6-2 as they opened with a series win at Visalia. The 66ers trailed 2-0 in the through four and had been stymied by Ports (61-41, 17-15) starter Zach Erwin who had allowed jus a hit and a walk in the second until he walked Julian Leon with one out if the top of the fifth. Alberto Triunfel then singled and DJ Jenkins followed with an RBI double to left off Erwin (7-8). Brandon Marsh' RBI infield hit tied the game and Jo Adell then drilled a single up the box to bring in a run and give the Sixers a 3-2 advantage. An missed popup on the infield brought home another run to make it 4-2. Lefty Ty Damron came in in the sixth for the Ports and Leon drilled a solo homer to right to make it 5-2. It was Leon's fifth of the year. In the sixth Franklin Torres smoked a homer off Damron to center making it 6-2. Torres had three homers in the last two contests at Banner Island Ballpark. After Matt Ball allowed two runs for the Sixers in four frames, Mattson came in and dominated. The righty from the University of Pittsburgh gave the Sixers five innings out of the pen and did not allow a hit until the ninth. He tossed five shutout frames to earn the win walking four and fanning two batters. Brett Siddall hit a solo homer for Stockton, his first since coming back to the Ports from Double-A Midland.